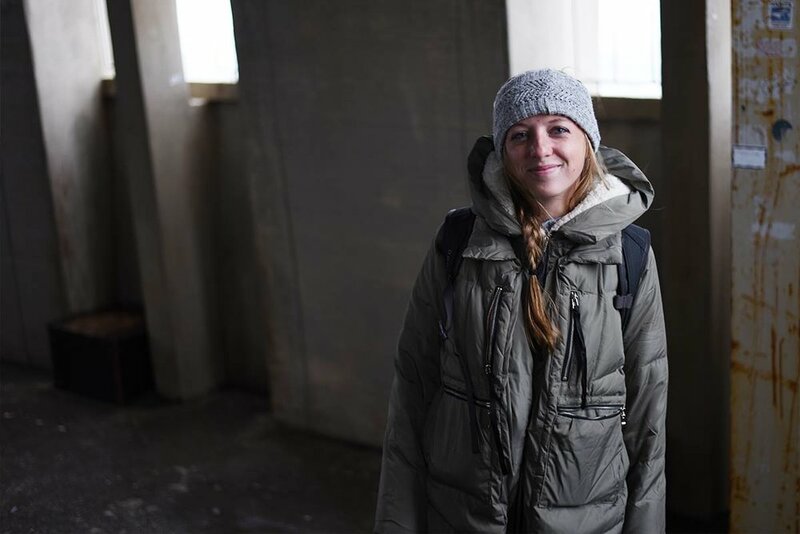 The first of several installments documenting a wonderful trip to Iceland, taken with my dear friend Karly! This was both of our first times to visit Iceland, and we loved every second of our trip! Here’s everything we did and saw on our first day. We first stepped foot on “the land of fire and ice” early Friday morning and were greeted by cold temperatures (hello, we are no longer in Alabama), wind and rain. After getting our luggage and pointing out every non-American thing we saw in the airport (tiny toilets, in-airport liquor stores — everything was exciting and new at this point) we headed to the car-rental area to retrieve our wheels that would take us to every magical place we had spent months reading about. Left: Our flight from Atlanta to Boston. Right: Arriving in Iceland! After taking a shuttle to the nearby car rental service, we waited in what looked like an Ikea shed for about an hour — waiting to sign all the papers and get our keys. Side note: we were both slightly panicking at this point! Our southern skin was not faring well in the cold temperatures and Iceland was living up to its name. After warming up with some complementary hot chocolate and adding on a few pairs of socks and gloves, we retrieved the keys to what would become our beloved adventure mobile. Our first stop: Grindavík, home to one of the few usable harbors on Iceland’s southern coast. We warmed up at Café Bryggjan, a cozy spot along the water known for their lobster soup served with bread and butter and coffee or tea. This seaside spot was decked out in fishing gear and memorabilia from the Faroe Islands. After consuming copious amounts of coffee and buttered bread, we wandered upstairs and found the most charming little library and a window that overlooked the water. Left: Lobster soup, buttered bread and coffee at Café Bryggjan. Right: The cafe’s interior — decked out in fishing gear and memorabilia. Checking out some coastal views from above Café Bryggjan. Feeling a little jetlagged, we took a quick nap in the car before beginning out trek to our Airbnb in Reykjavik (the winds were still strong at this point — but we were so exhausted we barely heard the gusts against the car!) 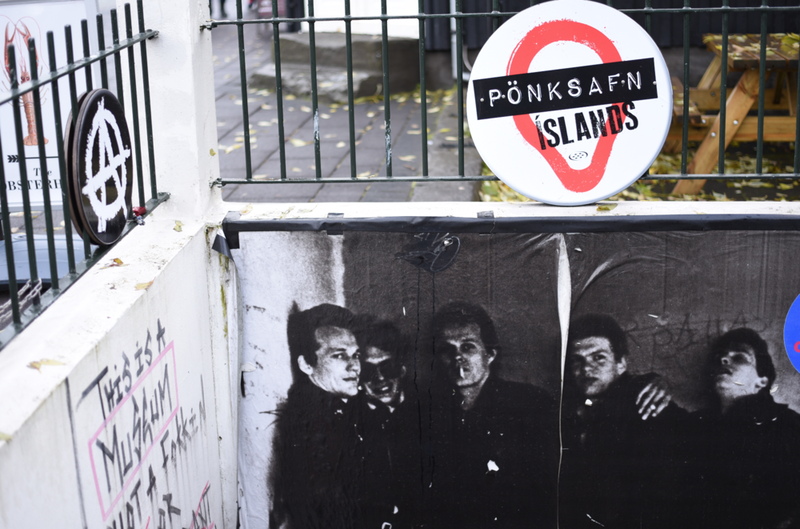 After our power nap, we hit the road and headed to Iceland’s capital city. 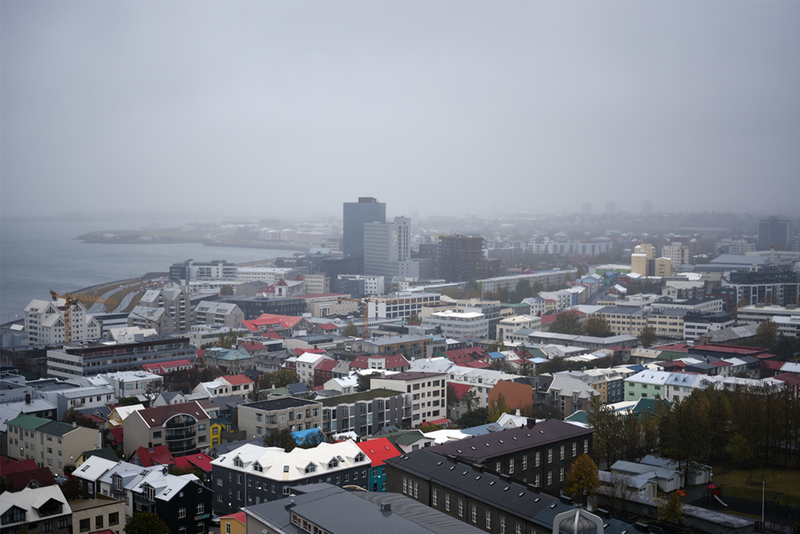 A colorful cosmopolitan enclave within a stark landscape, Reykjavik instantly charmed us. Previous research didn’t do this city justice. 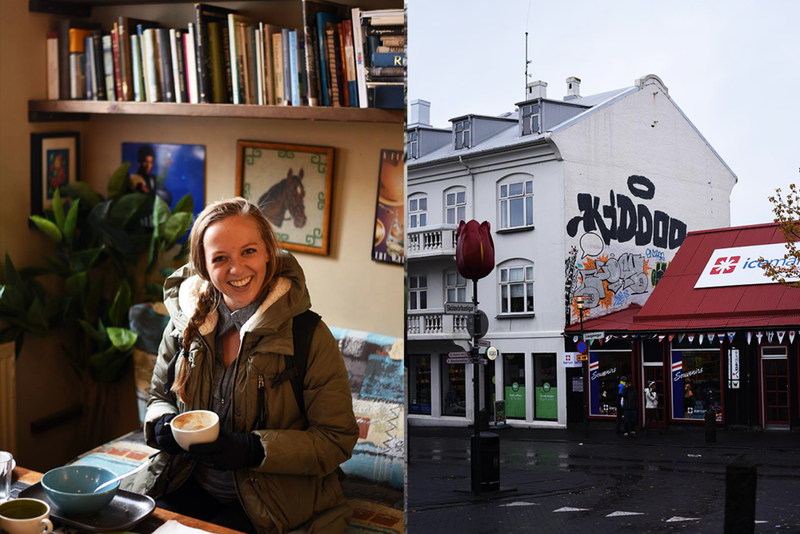 Colorful roofs and street art dotted downtown, and cozy coffee shops peppered every corner. The city’s streets were lined with quirky art galleries, upscale restaurants and rollicking bars that had everything from craft beer to high-end cocktails. Our first stop in this handsome city was Hallgrímskirkja — the Lutheran church that often serves as the calling card for the city. Standing tall smack dab in the middle of downtown, the church is made of crushed volcanic rock and is a sight to behold. The building’s shape is meant to recall Iceland’s volcanic origins. Once inside the stately church, we were greeted by beautiful organ music and contemporary art installations in the entry’s foyer. The church’s main draw is its bell tower, which boasts a sweeping 360-degree view of the city. After taking the elevator plus the 33 steps needed to reach the top, we admired the impressive view. Peeking between the iron bars and seeing the town from above was the perfect way to kick off our first day in our temporary Icelandic home. Travel Tip: Find someone who’s cool with taking your awkward solo shots. 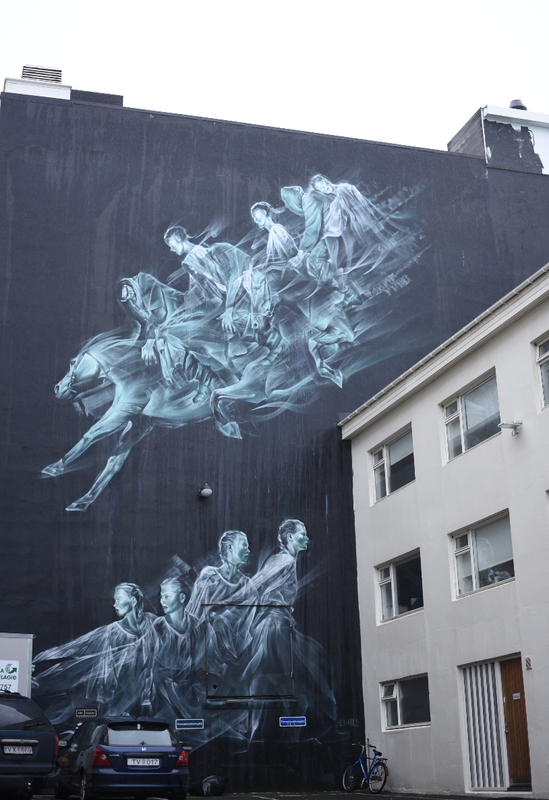 One of the many street murals in downtown Reykjavik. Left: Karly enjoying a latte at Café Babalú. Right: One of the many colorful buildings of downtown Reykjavik. Stairs leading down to an uderground punk museum in Reykjavik. Icelandic hot dogs — so good! Trying out the local beer at Kaffi Laulaekur! This was “Turog classic,” a light pale ale. After walking through downtown Reykjavik, we began working up an appetite. Traveling Iceland on a budget, we knew most of the restaurants would be out of our price range so we stopped for some “street dogs” — which ended up being delicious! From there, we headed to our Airbnb to unpack, clean up and get ready for the Blue Lagoon! Energized by some downtime at the Airbnb and a quick trip to a nearby café for some granola and local beer (recommended by Ulfar, our Airbnb host), we got in the car and drove to the Blue Lagoon. This was the first time the rain subsided and we were able to get a glimpse of Iceland’s beautiful landscape. Some of Iceland’s beautiful landscape. After bearing the wind and cold to make it to the waters, we sunk into a view that was unlike any other. The naturally-heated water and views of nearby mountains made this a truly one-of-a-kind experience. Bonus — we saw a rainbow as the sun began to set! The Blue Lagoon — absolutely beautiful! First-ever thermal bath experience! Photos don’t do this place justice. We ended our evening at the Lagoon with some Italian wine (served at the poolside bar, and free with our ticket) and plenty of laughs and great conversation. Once back in Reykjavik, we found some local pizza and reveled in our first day, which was already chockfull of great memories.